(AINA) -- A video obtained by Cybercast News Service shows Kosovo muslim men, dressed in military uniforms, desecrating and destroying a Serbian church as one of the men plays a stringed instrument and the rest sing. Stained glass images of saints are destroyed, pews overturned, and the Cross shot at with a machine gun. The mysterious "Frank" cited as a friend and adviser by Democratic president contender Barack Obama while he was growing up in Hawaii has been identified as Frank Marshall Davis, a member of the old Moscow-controlled Communist Party USA. The identification comes from Cliff Kincaid in his column, "Obama's Communist Mentor," which was made available on the Accuracy in Media website. "Let's challenge the liberal media to report on this," he wrote in his column. "Will they have the honesty and integrity to do so?" Kincaid, who earlier reported on Obama's pending plan to ship $845 billion overseas to battle "global poverty" as evidence of his socialist leanings, said the newly revealed connection is even more worrisome. 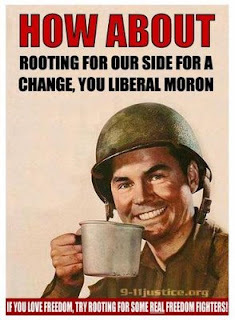 "Obama's communist connection adds to mounting public concern about a candidate who has come out of virtually nowhere, with a brief U.S. Senate legislative record, to become the Democratic Party frontrunner for the U.S. presidency," he wrote. In Obama's book, "Dreams From My Father," he repeatedly refers to his friend and adviser as "Frank." "The reason is apparent: Davis was a known communist who belonged to a party subservient to the Soviet Union. In fact, the 1951 report of the Commission on Subversive Activities to the Legislature of the Territory of Hawaii identified him as a CPUSA member. What's more, anti-communist congressional committees, including the House Un-American Activities Committee (HUAC), accused Davis of involvement in several Communist front organizations," Kincaid said. Kincaid noted Obama has admitted attending "social conferences" and seeing Marxist literature. "But he ridicules the charge of being a 'hard-core academic Marxist,' which was made by his colorful and outspoken 2004 U.S. Senate opponent, Republican Alan Keyes." He described the link as "ominous." "Decades ago, the CPUSA had tens of thousands of members, some of them covert agents who had penetrated the U.S. government. It received secret subsidies from the old Soviet Union," Kincaid wrote. He noted even Obama describes "Frank" has having "some modest notoriety once." Kincaid notes that a history professor in Houston reported that Davis "befriended" a family whose son was named Barack Obama, "who retracing the steps of Davis eventually decamped to Chicago." "It was in Chicago that Obama became a 'community organizer' and came into contact with more far-left political forces, including the Democratic Socialists of America…," Kincaid wrote. "The SDS laid siege to college campuses across America in the 1960s, mostly in order to protest the Vietnam War, and spawned the terrorist Weather Underground organization." He also reported Kathryn Takara, a professor of Interdisciplinary Studies at the University of Hawaii at Manoa, confirmed that Davis is the "Frank" in Obama's book. She did her dissertation on Davis, and wrote that he brought, "an acute sense of race relations and class struggle throughout America and the world" and that he openly discussed subjects such as American imperialism, colonialism and exploitation, according to AIM. Obama's campaign also, for the third straight day, declined to respond to WND requests for comment on the report of a Minnesota man who alleges he shared cocaine with Obama when Obama was a state lawmaker in Illinois. When it still was ignored, Sinclair said, he filled a lawsuit in Minnesota District Court, alleging threats and intimidation by Obama's staff. It's this bloggers opinion that we've so dumbed down our population, allowed the victim mentality to go unchecked, and perpetuated public welfare system for so long that we are doomed as a nation unless we pull ourselves up by our bootstraps, and take personal responsibility for our actions, educations and livelihood. Will Hillary or Barrack help this poor woman! Sharon Jasper has been victimized. Sharon Jasper has been rabidly wronged. 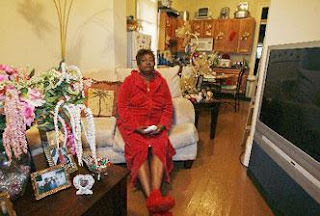 She has become a Section 8 carcass--the victim of ever changing public housing policies. Sharon directs the reporter's attention across the street to Duncan Plaza where homeless people are living in tents and states that, 'I might do better out there with one of these tents.' She further lamented her sentiments about her situation,' I might be poor, but I don't have to live poor..
Good God in Heaven, help us from increased government help. We might end up with thousands more "Sharon's"....no thanks....blogger note. January 2005 for the reestablished Fulbright program? 100-foot patrol craft, 34 smaller vessels and a naval infantry regiment. and will soon add 16 UH-1 helicopters and 4 Bell Jet Rangers? over 3500 new officers each 8 weeks? primary school by mid October? Iraq and phone use has gone up 158%? radio stations, 180 newspapers and 10 television stations? schools have been built in Iraq? OF COURSE YOU DIDN'T KNOW. AND I DIDN'T KNOW!